Ever heard the expression barn sour? I had to look it up to learn that it describes some horses. Barn sour, or "herd bound," behavior is the result of anxiety produced by separation from something that represents security—the barn, the herd, a particular friend. The horse might shy or buck or whinny, fighting the trainer and trying to get back to perceived safety. The phrase struck some chord with me. Next month I’m going to a production of Lin-Manuel Miranda’s In The Heights, so I’ve been listening to the soundtrack. One character is struggling to put his daughter through Stanford—the first barrio kid to go to college—and he sings a heartbreaking song of doubt and shame and belief in his daughter, and you realize that in his mind, her success will predict his success. Will he have succeeded in giving her his boyhood dream of changing the world? Or, in the end, will his own father’s early prediction of him be his final dismissal: useless. Who is allowed to dream beyond the herd? Alienation stinks. Kids lose their identify. Kids aren't given wings to fly. They forget their strengths and value. They are controlled like you were for years. They are afraid to make someone upset. Their only voice of influence is one voice. They are afraid to live fully and dream big. May God be bigger than the fear. That’s it, right? We harbor so much fear. Some fear is innate, and some is given to us. And worst of all, too often our religion reinforces instead of liberating us from our fear. Fear of not being good enough. Fear of someone else’s success. Fear of leaving a particular friend. Fear of change. In the past few months I’ve experienced a dizzying re-alignment of friendships. I am making and deepening relationships with several wonderful new people. I am marveling in a new friendship with someone I’ve known, and misjudged, for 35 years. I am reconnecting with four friends in two states whom I’ve not seen in many years. And in the case of two of my oldest and dearest friends, we are acknowledging a low patch and are backing off for a time, at least as a trio. It’s unsettling, this constant shifting. It makes me want just to stay in my barn. 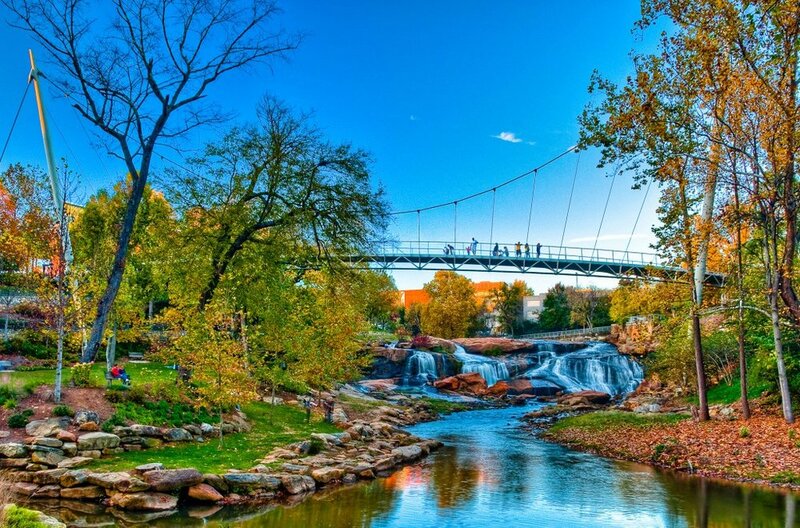 We finished the pizza, got the ice cream to go, and went to Falls Park, with its iconic pedestrian bridge over the Reedy River. He was amazed! My friend has lived for twelve years barely three miles from this place that’s considered the birthplace of the city. A wonderful, beautiful, free park. And he’d never even heard of it. Isn't part of my role as mentor to broaden his horizons, to help him see the things that are already around him, and to help him dream some bigger dreams? We each need people who believe in us, who give us room and encouragement to dream big dreams. But in dreaming big dreams we face new fears. The biggest fear might be the fear of succeeding. Do you believe this? Can I believe this? Why does it seem such a brave and bold step, to desire what God desires for me? I trust that God desires only good for me, that God’s desire is for me to live more and more fully into the Presence. I know that my discipleship helps to make God more visible in the world for others. So why my hesitation? Why my fear? To dare to become who God has created me to become means giving up who I am now. I do not want to give up my sins and my attachments. The remedy for a barn sour horse is to work with her slowly, not taking her too far away from her comfort zone at first. Getting her to focus on you. First work with buddies nearby, then make a sustained effort to focus the horse on the trainer. Give quick and positive reinforcement for good behavior/attention. Gradually increase the difficulty of the maneuvers, trying to maintain the relaxed, attentive posture. Expand the comfort zone and the trust of the trainer. We are barn sour creatures, herd animals afraid of moving beyond our boundaries. The trainer leads us, kicking and shying and biting and screaming, little by little into a larger truth. The trainer is patient and knows a truth about us that we do not yet trust about ourselves. Had the Jews lived in the grasslands of the Eurasian Steppe, perhaps Jesus would have told the parable of the Good Trainer. Be not afraid! Help others dream big dreams. Dare to dream God’s dream for you. The rest of us are counting on you.